D.O.A. Lures, founded by Mark Nichols, is totally dedicated to crafting incredible quality soft-rubber fishing lures that are impregnated with unique flavorings and designs that have a great ability to focus on individual fish. D.O.A. offers a full range of lures, including jerkbaits, swimbaits, jigs, worms, and others, all crafted out of a special, durable, soft plastic design that floats and swims totally naturally, has a natural feel to predatory fish, and is crafted with scents and flavors that drive your prey wild. They’re also quite inexpensive compared to many top-grade, “realistic” lures that incorporate hard plastic and more realistic paint jobs, which makes them a great choice if you have a tendency to lose a lot of bait, or you’re just looking to augment your tackle box with plenty of high-quality lures, so that you’ve always got the right bait for the right situation. In addition, their soft, rubbery design allows you to rig them in all sorts of ways, with whatever weights and hooks you prefer, so you’ve got total control over customizing your fishing experience, which is great both for seasoned experts, and novice anglers who are looking to increase their angling IQ through experimentation. D.O.A has also expanded their offerings into combos and clackers, and even D.O.A. bait kits, which include a massive ﻿﻿selection ﻿﻿of baits targeted towards just about any water type, condition, or intended prey fish you can think of. Their huge selection of baits range over freshwater, saltwater, and even into more specialized offerings, and they’re a great brand to turn to if you’re looking for top-quality, handcrafted rubber lures that are a little more fully featured than your typical inexpensive bait shop offerings. D.O.A. is revolutionizing the world of inexpensive, rubber-based baits with offerings that combine a great quality with a remarkable presentation, and they’re certainly an industry leader when it comes to rubber baits. In this article, we’ll go over some of their various offerings, across their jigs, swimbait, jerkbait, and other categories, as well as some basic beginner kits and some other specialized lures. So let’s get into it! The DOA SM-310 Swimming Mullet is designed with a soft rubber body, realistic jewel-set styled eyes, and an incredibly sharp, built-in hook. It’s made out of DOA’s classic shrimp-impregnated material, and it’s designed with a heavy weight profile that allows long casts, and serious speed while you reel it in. The soft design and top-mounted hook make this an ideal lure to use in tough conditions where other, hard-plastic lured may tend to catch and snag. It’s relatively weedless, and the soft design means it can squeeze to get through tough obstacles like rocks and other snags, making it a great choice for dock fishing, shore fishing, or fishing in crowded lakes and stream with lots of obstacles. While it will sink somewhat by itself, we do recommend rigging this bait up with some weights if you’re looking to go deep into the water column. As the name may suggest, this bait is best used over long distances – it’s got a great swimming action at just about any speed, and reeling it in over and over with varying degrees of speed and quick, sudden stops and jerks is sure to bring in predators from all around. 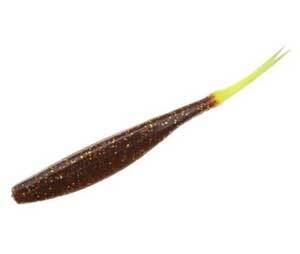 This pack of DOA Jerkbaits is specially impregnated with farm-grown baitfish essences that release upon contact with the water, which pairs with the subtle “root beer” colored body and chartreuse tail to create a great lure with a subtle presentation that maintains a flashy tail, and is sure to bring in fish with its sweet, powerfully attractive scent. This multi-pack offering gives you plenty of lures, so you’ll be covered even if a powerful predator rips one off your line. Its soft design gives it a wonderful, lifelike movement and reactions to even slight jerks of the rod, and its responsiveness and clarity of motion are sure to make you a happy angler. The body is heavy enough that it sinks slightly below the surface, so those of you who are unsure of your reactions and rod-feel may wish to pair it with a bobber or other surface indicator of some kind – the heavy body does sometimes cause false alarms. This lure is best rigged on a wide-gap worm hook, and can also be used on jigging rigs if you’re more of a fan of bottom-water fishing. You can use just about any hook that’s large enough, though, which gives you a ton of choice based both on application and preference. 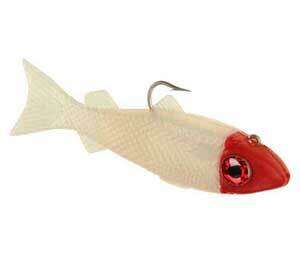 The DOA Cal Air Head 310 Lure in Pearl and Red is an incredible swimbait. The soft design (of course, with DOA’s standard scent and taste impregnation) combines with an incredible, realistic presentation that’s accented by a natural tail motion, and this neutral-buoyancy lure can be rigged for topwater swimbaits, mid-and-deepwater rigs, and even jigging rigs, making it totally customizable and giving you plenty of options depending on your personal preferences, and daily fishing requirements. No matter where you fish it, this bait is sure to please, and the soft plastic design means that it can handle adverse conditions that usually snag larger, hard-plastic swim and crankbaits, so you can fish without fear just about anywhere. 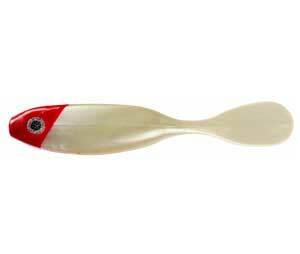 The presentation is great, with a natural wobble its descent and a side-to-side swimming motion with huge tail action that is really attractive to predators and varies in intensity depending on your cranking action, so you’ve got plenty of tricks to use when you want to vary its motion. It can be rigged with just about any hook as well, and its medium size means it can be rigged with both large, powerful hooks for large prey, as well as smaller ones if you’re in a more confined body of water. It’s also appropriate for both saltwater and freshwater applications, adding to its already stunning versatility. 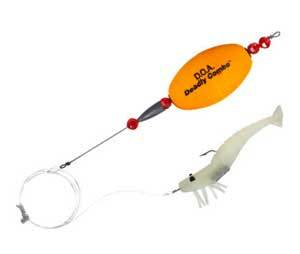 As mentioned, DOA doesn’t just exclusively focus on lures – they also offer some great combos, like a popper/clacker rig we’ll talk about below, and this combo shrimp/floater rig. This rig is totally ready to fish right out of the box – just attach it to your line, cast it out, and float it up. The natural shrimp design also includes DOA’s smell and taste technology, making it incredibly realistic and attractive to predators of all shapes and sizes. And the high-quality floater lets you just toss it in, let the currents take it where you please, and lock it in place when you’re happy with its position. 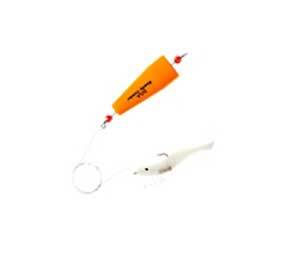 The high-quality weighted cork floater is covered in bright orange plastic which aids in spotting strikes and provides a good line-fell and reaction when a strike does hit, allowing you to feel for strikes even when it’s not in viewing distance. And while it does come with a clear/gold shrimp on the end, there’s nothing to stop you from rigging up this high-quality float however you want, making it a great addition to any tackle box given its quality and versatility. If you’re fishing in shallow waters and looking for an ideal walkbait/shallow swimbait, this Shallow Bait Buster should be quite exciting to you. Incorporating the realistic smell and taste of baitfish that DOA is known for, this lure goes even further, as it’s built to perfectly replicate the shape and color of a struggling baitfish, and has a wonderful action when “walked” near the surface of the water, kicking up plenty of splashes and making noise that’s sure to attract attention, even in the shallows. It’s 4” long and weigh 5/8oz, and you can rig it up pretty much any way you want, including your own custom hooks depending on the fish you’re going after. Its realistic presentation, high quality, and great design make it a great choice for surface fishermen, and it’s particularly suited to shallow environments where harder plastic lures can often suffer due to obstacles and snags. Maybe you’re looking for something more like a standard crankbait with BB-rattlin’ action that drives predators wild. Well, DOA has a specialized popper-clacker rig that does just that. Attached to the included Nite-Glow shrimp, the popper trails behind creating tons of noise that’s sure to attract the attention of predators, and can pair well not only with the included shrimp lure, but any DOA all-purpose lure, or even live baits, or the lures of competitors if you’re looking to add a little more noise to your rig. It’s a great value, high quality, and can be used with just about any rig, but it’s especially effective when you combine the loud, realistic clacks with the scented and tasty rubber baits that DOA develops. Last, but not least, we’ve got the best value that we’ve maybe ever seen. This insane deal has 50(!) 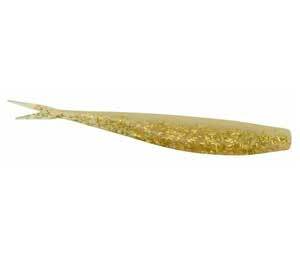 3 ½ inch shad-tail lures, all of which incorporate an attractive golden color scheme, natural baitfish profile and silhouette, and the DOA scent-and-smell technology that they’re famous for. These baits are insanely versatile. They can be jigged, suspended, run as topwater lures with floaters, run as swimbaits with clackers to imitate a standard crankbait, or walked and used as jerkbaits. It all depends on how you rig them, and we think that this pack of lures should be a go-to- for any fisherman looking to fill up a tackle box with versatile, high-quality lures. It’s an incredible deal for some incredible lures, and if you only pick one product of this list, this is probably the one we’d have to recommend, based on value alone. These lures can’t do everything, but they come closer than just about any other soft lure we’ve come across. That about does it for our reviews of DOA lures. This is a great brand, and possibly the best soft-rubber lure brand out there, with a great combination of quality, inexpensive lures, and great naturalistic design that combines with the shrimp and baitfish impregnated soft plastic that can draw in predators from far and wide. Regardless of if you’re looking to get away from the standard, hard-plastic lures, or you’re on a budget and don’t want to spend the money on expensive lures, DOA is certainly worth a look.